Professional home applications are all the rage! What are modern customers saying today? "The pathway to a more beautiful, radiant skin appearance and the effective treatment of problem skin should be based on professional yet convenient, uncomplicated treatment methods." This requirement has caused Wellcomet® to create a truly unique product by the name of Skinova®. Our lightweight, transportable Skinova® is an innovative machine using 10 MHz ultrasound technology from Wellcomet®. It was developed as part of a rental concept specially for effective home treatments for customers. The sonotrodes (handpieces) are wireless and can thus be equipped at any time from the base station to suit the customer's particular indication. Different sonotrodes can thus be rented separately to several customers at the same time. Treatments with Skinova®, based on the Wellcomet® superfractionation method, form a completely new type of therapy that not only ensures a more beautiful skin appearance within just a short time, but can also considerably improve the effectiveness of aesthetic treatments. Superfractionation is based on the realization that the regularity of treatments is often more important than the intensity with which the individual treatments are applied. 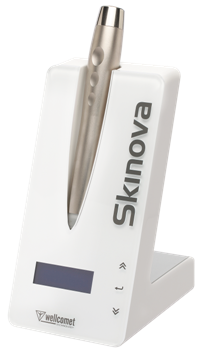 On the basis of these conclusions and using modern 10 MHz technology, we have created the convincing Skinova® solution, which allows customers to carry out effective, very concentrated skin treatments conveniently and regularly (up to twice a day) on their own at home over a specific period. Skinova® can be combined with LDM®-machines within a special all-round SKIN MANAGEMENT LS treatment concept in order to achieve even better, more stable treatment results. With its 10 MHz technology, the machine is completely different from traditional home-treatment products. In contrast with other ultrasound frequencies, this frequency works with a half value depth of just 0.3 cm (approx. ), almost exclusively in the upper layers of the skin, such as the epidermis and dermis, i.e. precisely where, for example, most ageing processes occur.